James C. Cameron first enlisted in the 64th Regiment of Illinois Infantyry, Co. A, Yates Sharpshooters. He was promoted to Captain 12 September 1862. He was listed present with the 1st Alabama, detached by special order from 64th Illinois and not aggrigated on the March 1863 monthly returns. 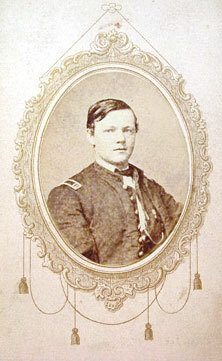 On 15 April 1863, he was detailed by order of General Dodge to command the 1st Regiment of Alabama Cavalry Volunteers. After his death, his brother, Captain Alexander Cameron, requested permission to be absent from his command for 30 days to take his remains to the family burial ground at Ottawa, IL. The tombstone photo is of a memorial dedicated to James Cameron and four other Civil War Soldiers. It is located in the Ottawa Avenue Cemetery , Ottawa, IL.